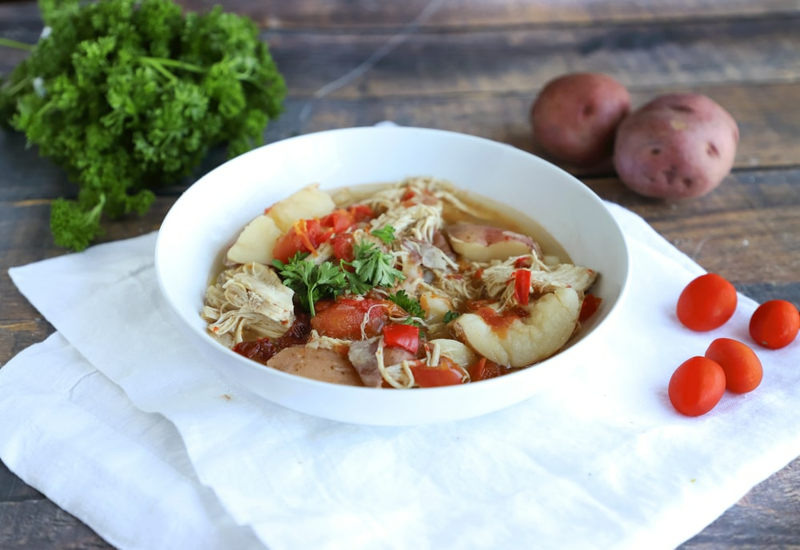 Get a Mexican-style bowl of comfort food from your pressure cooker with this chicken soup recipe. Chipotle adds a kick of spice and flavor to this chunky chicken soup. It cooks entirely in the pressure cooker with onion, potatoes, and tomatoes. This is a great belly-warmer for colder weather, but that doesn't mean you can't make it in summer and enjoy it outdoors with a frosty beverage! If you prefer a soupier consistency to your soup, use an additional cup of chicken broth. Crumble tortilla chips into your bowl to mimic tortilla soup. If you find the soup slightly too spicy, try stirring some sour cream into your portion. You can even stretch this one a bit with the addition of a can of white beans. Per Serving: 595 calories; 7g fat; 67.6g carbohydrates; 62g protein; 145mg cholesterol; 293mg sodium. I add chipotle to almost everything because I love the flavor that much. Especially in this soup! I left out the extra cup of broth because I wanted a really rustic soup. I achieved the exact results I was looking for in the pressure cooker. The potatoes were definitely my favorite. I used yellow potatoes and quartered them. So good!